Captain Sharon Raydor and her team will be back next summer. TNT has renewed their popular Major Crimes TV series for a fourth season of 16 episodes. 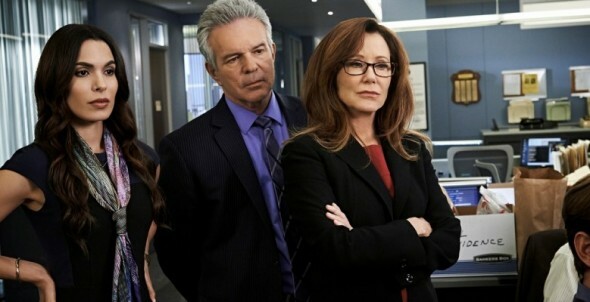 Airing on Monday nights, Major Crimes follows the further investigations of the detectives in the Los Angeles Police Department’s Major Crimes division. The crime drama’s cast includes Mary McDonnell, GW Bailey, Tony Denison, Michael Paul Chan, Raymond Cruz, Robert Gossett, Phillip P. Keene, Jonathan Del Arco, Kearran Giovanni, and Graham Patrick Martin. So far, the current season has been averaging 4.98 million viewers each week, up about 5% when compared to season two’s ratings. There are 19 episodes in season three and only 10 of them have been scheduled for this summer so far. Today, the cable channel also renewed The Last Ship and Falling Skies for next summer. The latter will return for its final season. What do you think? Do you like the Major Crimes series? Are you glad that it’s coming back? I really like Major Crimes and all the actors. I hope it stays on the air. No, I am not glad to see it return. I am tired of Rusty and Mary McDonnell. No spark in the show. Great show hope it never ends I love all the characters !!! Outstanding cast. Just love this series. So glad it’s coming back!! Major Crimes is my favorite show – can’t wait for its return! I WILL KEEP YOU IN MY HEART !!!!! THANK YOU FOR SEASON 4. I WILL TREASURE ALL !!!!!!!!!!!!!!!!! I can’t wait for the best crime show on tnt. Next to Chicago PD, it’s a great show. I can remember when I could not stand Capt. Sharon Rayder. Now she’s the best on the show. Andy and Sharon, what a great story line. Rusty (Patrick) Louisiana proud! I really like Major a rimes and hope for its soon return. We are anxiously awaiting the new season of Major Crimes. It has enduring characters not found in other crime shows. Always interesting plots with twists and turns. Love Major Crimes. It would be wonderful if there could continue to be smart, savvy, interesting shows with a balance of dialogue and action still on the air. Please continue to keep Major Crimes on the air. Thank you! Major rimes is both my and my husband’s favorite crime show. It’s intelligent, quick moving, pertinent in todays news and all of the cast members are great! I love MAJOR CRIMES !!!!! So glad it has been renewed. Hope for many seasons to come. Love the whole cast.